For me, (although we were never strangers to ‘hand me downs’ as children) I guess collecting vintage clothes started as a young teenager when I fell in love with 1950s & ’60s Rock ‘n’ Roll music & wanted to dress accordingly, and particularly when I started to go out to Rock ‘n’ Roll events in Norwich in the late 1980s & discovered a whole ‘scene’ with everything that went with it. So, from the music came clothes, hairstyles, jewellery & accessories, films, homeware, cars, memorabilia etc etc and at that time, it was important for ‘Rockabilly Scene’ people to be as original & authentic as possible. 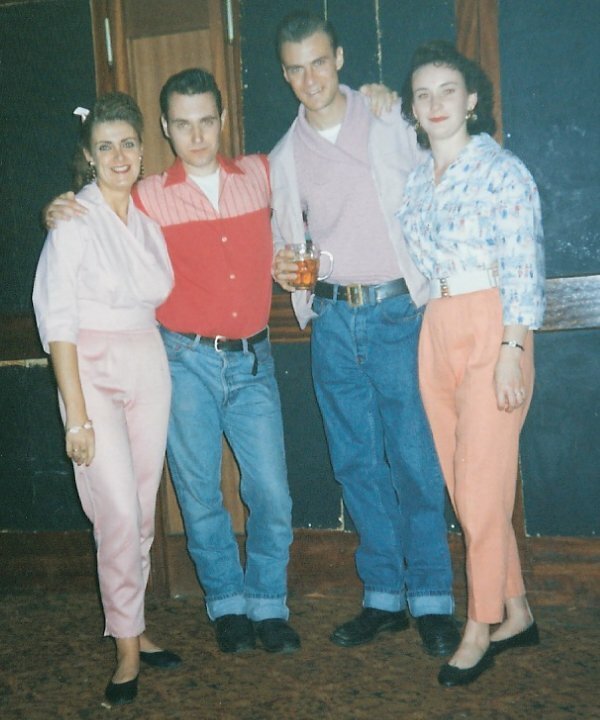 Me & Simon with our friends Sandra & David at a Rock ‘n’ Roll weekender in the early ’90s. From this, I realised that wearing an original 1950s dress was a sure fire way to look unique as well, which I have always strived for, and for anyone a bit creative & artistic, I think having a unique look goes hand in hand. These days there is much more mixing & matching vintage clothing with modern high street and charity shop finds to create unique looks, and creating a style that’s unique to yourself is a rewarding & attractive idea to a lot of people of all ages. Then there’s the quality: ‘they don’t make them like they used to’ is a cliche that is very appropriate to clothing and in my own experience, I have every day cotton St Michael label shirt-waister dresses that were around 30 years old when I bought them & I have gone on wearing, washing & wearing them for another 30 years or so (I know, I don’t look that old…) and they’re still going, whereas when I have bought high street clothing over the years for school or work, they really don’t look that great for long…There’s always the fit too – some of my ’50s dresses have so many darts & pleats that they can be a nightmare to iron, but by golly they hang well when on! There doesn’t seem to be the attention to fit and detail in the modern day equivalent. See my blog ‘That Dress No. 1’ about one of my favourite dresses for the full story on style & durability! I guess another aspect for me regarding wearing actual vintage as opposed to reproductions or look-a likes, is that I love the idea of wearing a piece of history, I’ve always found it exciting to think that the dress I’ve just acquired actually existed in the time period that I love (but didn’t experience myself) and who knows when & where it was worn? Did that ’60s bag I bought in a charity shop in Liverpool ever go in the Cavern? 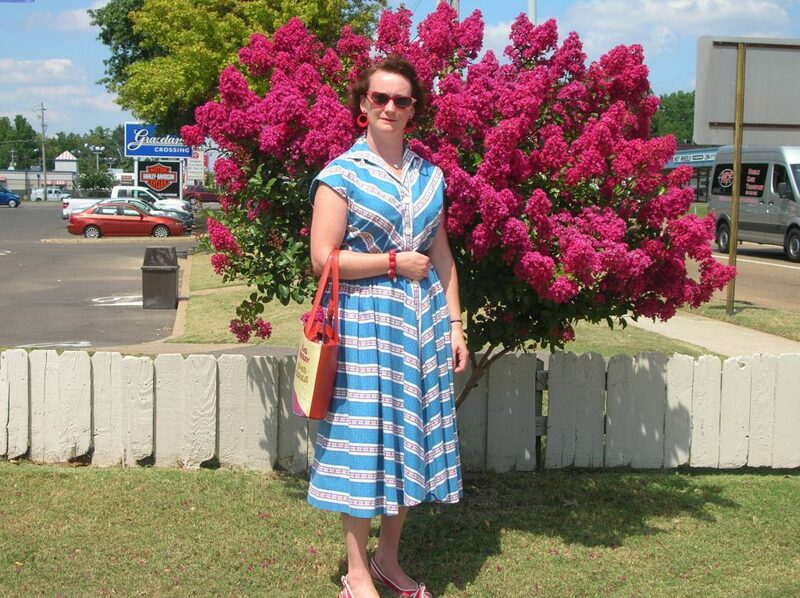 What about the fifties clothing we bought in Memphis? and as I’m washing & maybe repairing a new find, I often wonder how the original owner felt when they bought it – was it for a special occasion? did they go dancing in it? was it a favourite of theirs for years? This concept also gives me a lovely feeling when I sell stuff on too, as I think about the exciting new adventure that garment is about to embark on….an idea I explored a bit more in a previous blog when a ’50s shirt I rescued in Norwich was bought by a customer in California. 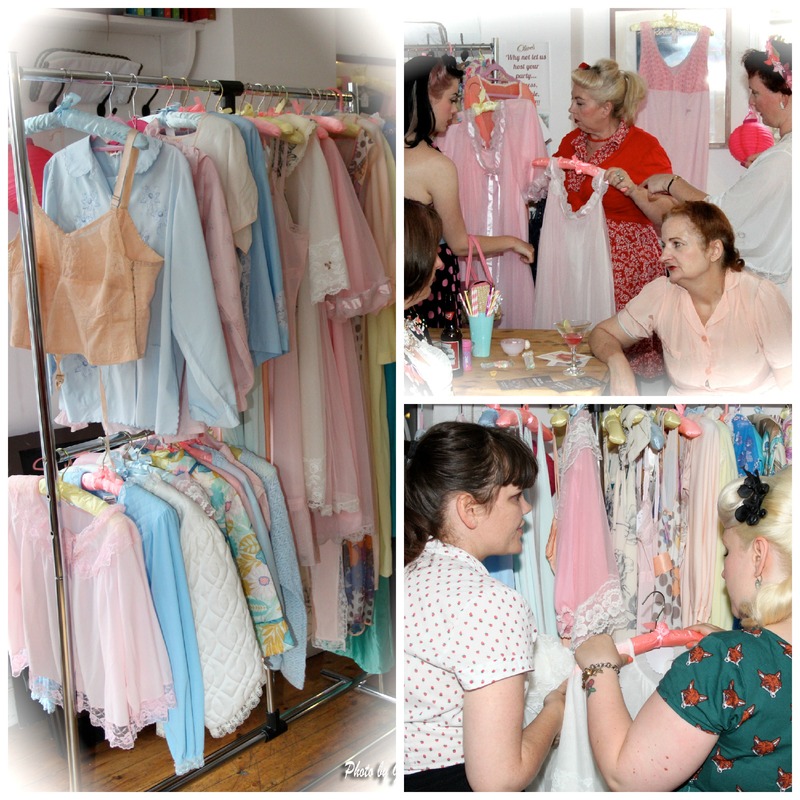 Images by Gary Yallop taken at one of my vintage nightwear events. 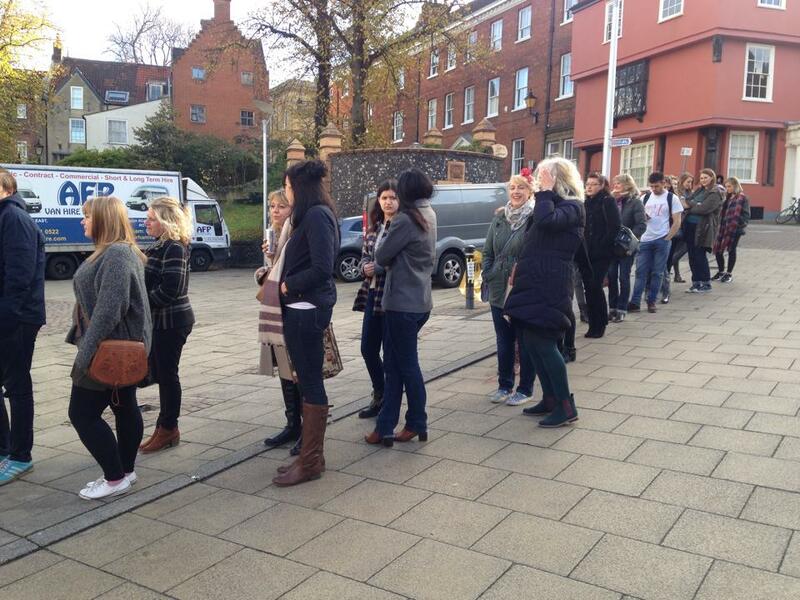 Queueing around the block for sustainable clothes shopping in Norwich at the Vintage Weigh & Pay! 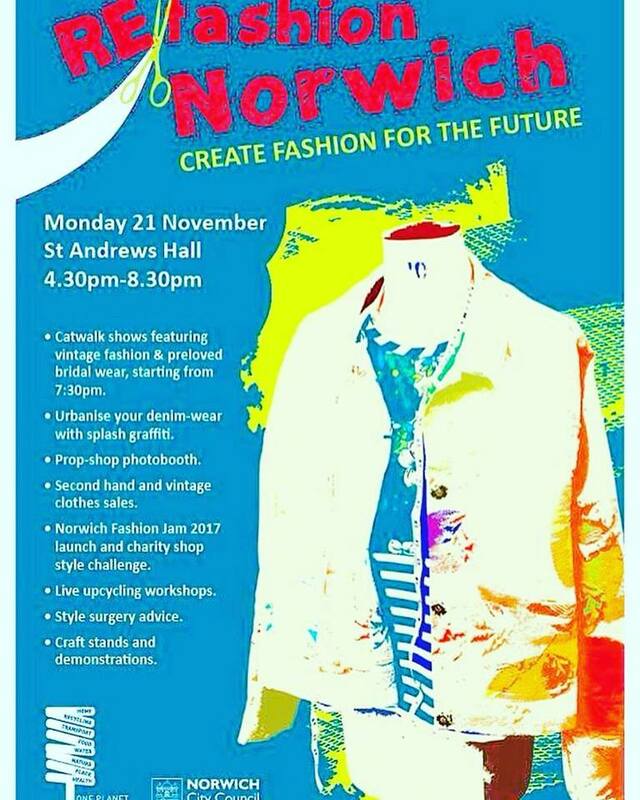 So, with a view to creating more awareness of this issue and tho highlight some ways we can all help to reverse it, One Planet Norwich are holding a free event in Norwich on Monday 21st November called ‘ReFashion Norwich’ highlighting sustainable fashion whilst having some fun along the way with stalls, fashion shows & workshops improving awareness on how to upcycle your unloved garments and give them a new lease of life. I know many vintage enthusiasts aren’t fans of the word ‘upcycle’ so let’s look at it as a modern version of ‘Make do and Mend’ – the principle is the same! 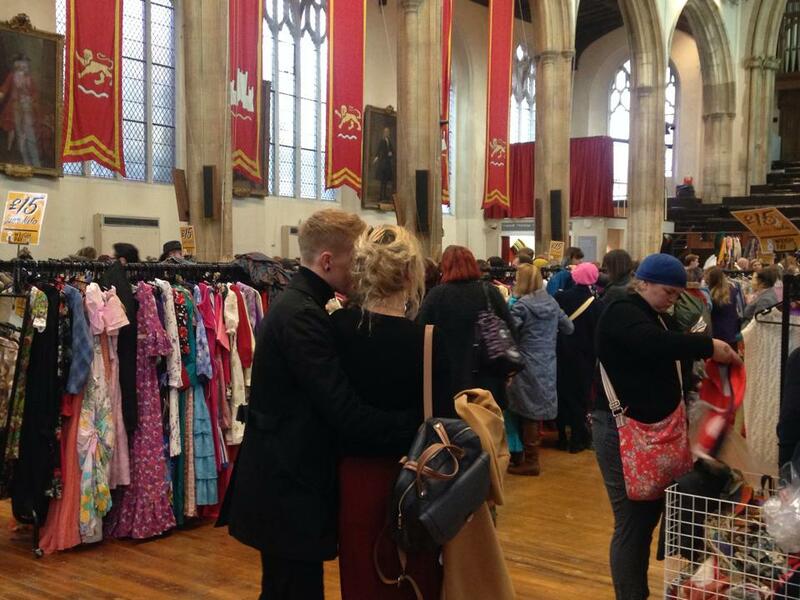 Wake Up Little Susie will be there with a stall of bargain vintage clothing & accessories including a 2 for £5 mix & match sale trunk plus fabric, vintage patterns & sewing bits so all you need to create unique & sustainable outfits, & maybe do some Christmas shopping into the bargain! Really looking forward to seeing the catwalk shows & workshops too, so watch this space for my review of the event!